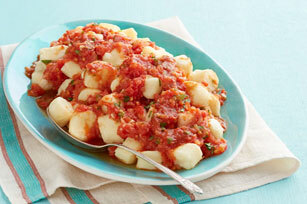 Cream cheese adds the perfect flavour and texture to these plump, pillowy gnocchi. Top it off with your favourite sauce. Add potatoes to cold water in saucepan. Bring to boil; cook 20 to 25 min. or until potatoes are tender. Drain; let stand 5 min. or until cool enough to handle. Use box grater to grate potatoes; spread onto baking sheet. Cool 15 min. Place potatoes in large bowl. Add cream cheese; mix well. Add Parmesan and flour; mix well. Shape into ball; knead lightly 8 times. (Do not overmix.) Cover with clean kitchen towel; let stand 15 min. Divide dough into 8 pieces; place on lightly floured surface. Roll each piece into 12-inch-long rope. Use sharp knife to cut dough into 3/4-inch pieces; spread onto parchment-covered rimmed baking sheet. Cover with towel. Grate onion with box grater; set aside. Place grater in shallow dish; use to grate tomatoes, reserving juices in dish. Heat dressing in large saucepan on medium-high heat. Add onions and garlic; cook and stir 3 to 5 min. or until onions are softened. Stir in tomatoes and reserved juice; simmer 5 min. or until tomatoes are tender and liquid is reduced by one-third. Stir in basil. Bring large saucepan of water to boil. Stir in salt. Add about 2 doz. gnocchi; cook until they rise to surface. Remove from water with slotted spoon; place in large serving bowl. Repeat with remaining gnocchi. Top with tomato sauce. Traditional gnocchi are pressed on a fork to curl them and impart the traditional ridge. When grating the onion and tomatoes, discard vegetable ends or peels that do not grate easily. If you don't have a box grater, you can use a potato ricer or food mill to grate the vegetables. Substitute 1 undrained can (28 fl oz/796 mL) diced tomatoes for the grated fresh plum tomatoes. Garnish with torn additional fresh basil leaves before serving.